Site should provide ample space in which to set up the courts. Always remember that safety comes first! Outside the court boundary make sure you have left a sufficiently unobstructed “play” zone. 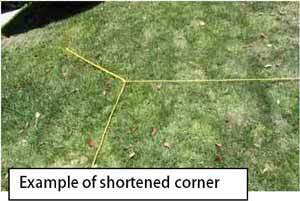 You should have a minimum of 20 feet between each sideline and end line when possible. 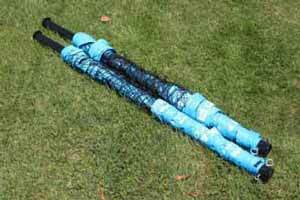 Lay out court lines on field by unwinding them off the court winder and placing them opened out on the ground in a rectangle approximately 30×60 for 11-12 and 13-15 age groups and 25×50 for 7-8 and 9-10 age groups. For younger players, shorten the court lines by tying off the corners, measuring two feet in from corners by extending your right arm out sideways from the body while holding the corner in your right hand, sliding the lines through the fist of your left hand, holding your fist at shoulder level. 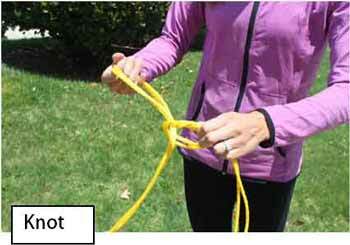 Knot off lines at the fist and push attached spike firmly into the ground, pulling lines taut, having shortened the lines by approximately two feet – the distance between your extended hand and your shoulder. Repeat this at each corner. 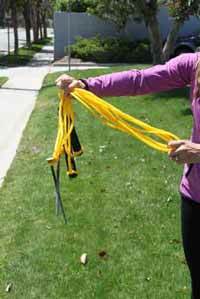 USYVL always recommends using the court winder and wrapping the boundaries one line at a time to avoid tangling and to make set up faster. 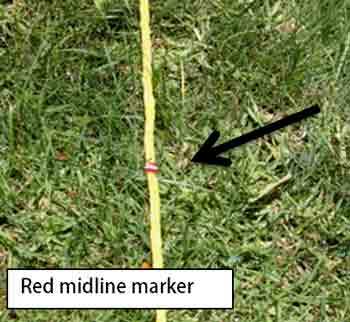 Red midline markers are found half way down on each side line. Note where they are located. 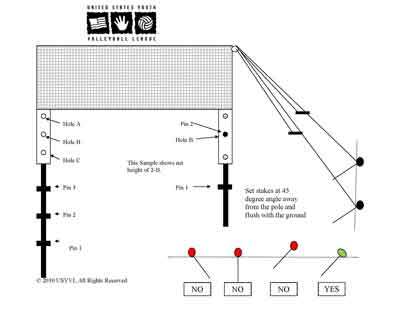 Next unroll the net, attached to the poles, with the bottom of the poles resting one foot outside the red midline markers on the two side court lines. 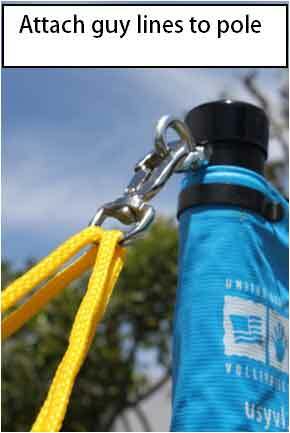 Take the guy lines and attach the clips to the eyebolts on the top of both poles, while holding the poles. 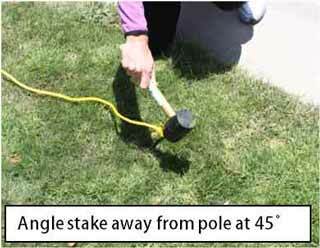 Holding the poles upright, extend the guy lines out to a 45 degree angle in both directions and anchor guy lines approximately six feet apart, with steel stakes, inserting stake into knotted loop at end of guy line, wrapping line once around stake and inserting into ground at a 45 degree angle (head of stake away) from the pole. 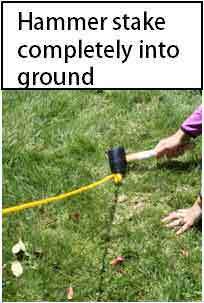 Wrap line around stake and then hammer stakes completely into the ground to avoid players or bystanders tripping or catching on protruding stakes. 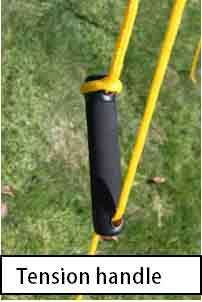 For proper stabilization and tension of net poles, the stakes MUST be inserted into ground at an angle AWAY from the net poles. 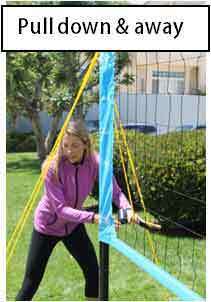 Lean poles towards the center of the court and pull down and away from the poles on the guy line tension handles. 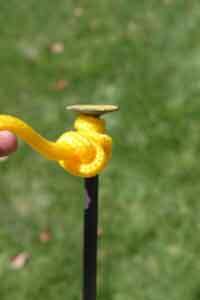 This creates the tension that keeps the net system in place. 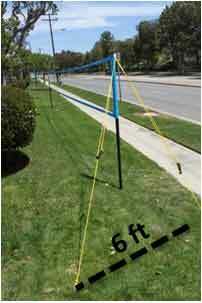 The poles attached to the net should set evenly on the ground. Adjust net height accordingly for each age group. Your Clinician will specify the net height for each age group.